These washers can be fitted under the spoke head between it and the hub flange on hubs with thin flanges such as Sturmey Archer and SRAM steel hub gears. The point is to bring the spoke bend close into the hole and reduce the risk of failure at that point, sometimes 2 or even 3 washers can be fitted per spoke depending on hub thicknes, the hole size and the length of the bend. Note: To fit these washers involves being able to build a bike wheel. There are a few problems with these washers. Firstly they are about 3 times as thick as DT swiss proline washers which can make seating the spokes at the hub flange tricky secondly many of the washers holes are drilled off centre by quite a bit which means when you come to seat the head of the spoke some washers can slip inside the bevel of the spoke hole on the flange of the hub. All in all i'm not that impressed with them, I build plenty of wheels as a mechanic and in my opinion (not everyone may have had these issues) the DT swiss proline washers are of a much higher quality, although they come in packs of 1000 the extra money is worth it for the quality as it should be for wheels you will spend precious time and effort building. 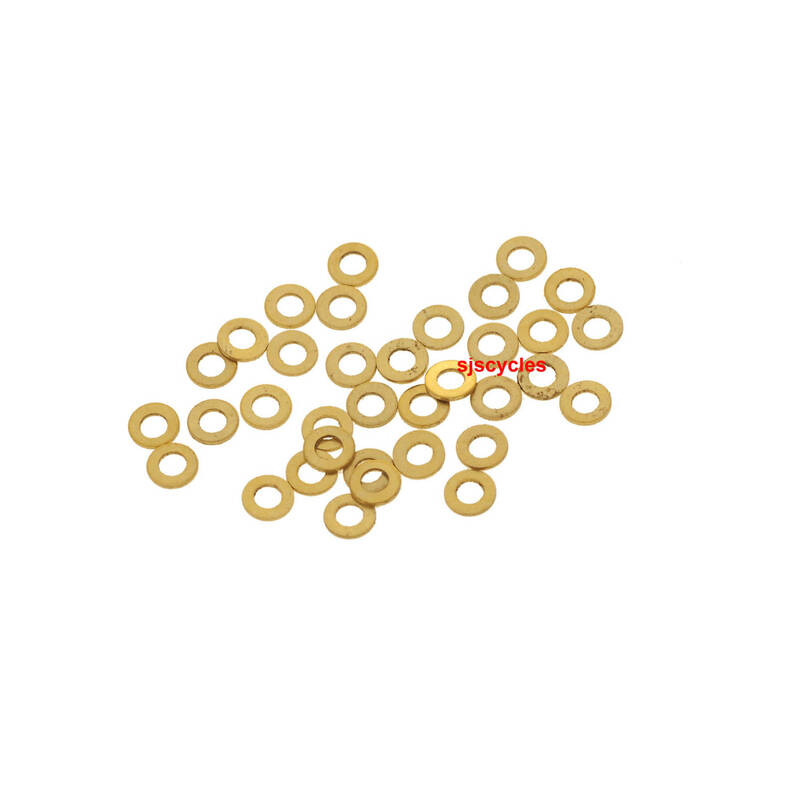 Brass Washers... Whats More To Say? what's to be said..., they make the 1.8mm spokes I have been using recently fit snug on the hubs which have 2.3mm holes drilled in them. Will they fit on 13g, 2.34mm spokes?